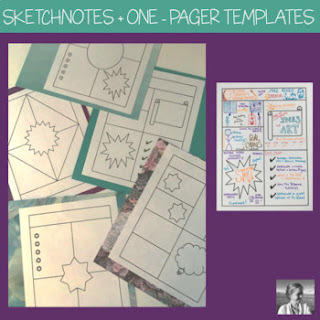 If you're looking to inspire your students to work on one-pagers or sketch notes so they can better process and retain the information they are trying to learn, this packet of templates can help. They give students a little structure to help them get started on the process of capturing ideas through a combination of words, icons, sketches, symbols and containers. Unlike my one-pagers line, this product is templates ONLY. It's intended for teachers who want to provide their own directions for one-pagers or who have introduced sketchnotes as a concept and want to help students feel less intimidated as they approach the blank page. Join the community of teachers who want to engage their students AND go to bed before midnight each night! Stay tuned to Spark Creativity Online.